For many young adults, experimenting with drugs and alcohol as an early teen can lead to serious addiction problems by their late teens and early 20s. Because young adults’ life experiences and clinical needs are different from those of older patients, Oxford Treatment Center provides a tailored substance abuse treatment program designed for our residential patients as young as 18 and up to their mid-20s. Why do young adults benefit from a specialized treatment program? Lower motivation for treatment and/or resistance to treatment. Less awareness and understanding of the consequences of addiction. More likely to view drug and alcohol abuse as normal. More likely to learn through active therapies than through traditional counseling alone. Patients in the Young Adult Program devote more of their treatment schedule to experiential therapies including art, music, ropes course and equine therapy. Extended outdoor experiences alongside counselors and fellow patients help patients address problem behaviors while fostering personal and social responsibility. Within their treatment program, young adults take on responsibilities such as feeding and caring for their own equine-therapy horse. In the interest of long-term recovery outcomes, patients remain in the residential program for 6 weeks rather than the standard 30 days and follow a more structured daily schedule. As a key component in Oxford Treatment Center’s Young Adult Program, Wilderness Therapy invites patients to take part in hiking, boating, fishing, camping (seasonal) and rock-climbing. Each activity has its own value, as patients relearn what it is to enjoy the world around them without using drugs or alcohol. But the conversation that happens along the trail is even more important. 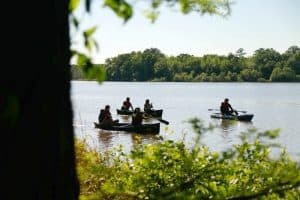 By engaging the outdoors alongside an experienced therapist, young adults in treatment at Oxford Treatment Center are able to process the issues they’re dealing with and reawaken parts of themselves that have been long buried beneath addiction. As always, our goal is to use the most effective means possible to equip our patients for long-term recovery.